DogsBite.org - A hot tipper sent in imagery from a kid's temporary tattoo machine last night. 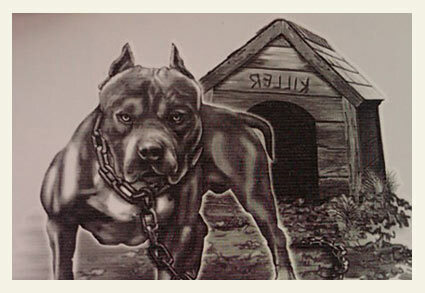 The image depicts a muscular chained pit bull with the name "Killer" spelled out on the animal's dog house. Given how many children suffer horrific maulings1 and deaths by chained pit bulls, it is hardly appropriate imagery to be coming out of a children's tattoo "safety" machine. The related website is tattoosafety.net, copyrighted by Flatline Corp. and printed in the U.S.A. 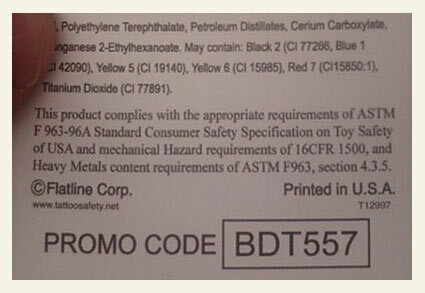 The back of the tattoo reads: "This product complies with the appropriate requirements of ASTM F 963-96A Standard Consumer Safety Specification on Toy Safety of USA and mechanical Hazard requirements of 16CFR 1500, and Heavy Metals content requirements of ASTM F963, Section 4.3.5." Despite pit bulls killing 187 U.S. citizens since the last CDC report on fatal dog attacks by breed was issued in 2000, the U.S. government has no warning requirements for pit bulls. 1DogsBite.org recently ran across a follow up video of Lexi. Sure enough, her mother is a full-fledged Nutter. Crazy tattoo. One clarification, the word "killer" will be spelled forward (correctly) once the tattoo is applied since it is a transfer. Criticism of this product, marketed to children, is valid in my opinion. The image is chilling. When on the skin, the dog's name "Killer" appears behind the image. Who signs off on things like this? Wow, that is twisted! But it reminds me that I saw one of those tatoo machines that had two sides — one side was pretty rainbows and unicorns, the other side was gangsta dogs — all pit bulls in different poses, scary like this one! Wish I'd thought to take a picture of it. There was a name for the series, too. I can't remember it, but Probably "Gangsta Dogs!" Incredible. Do they have weapons tatoos for children too? Children in my neighborhood have told me they want a pit bull…and it is not about wanting a dog – its about wanting a tough guy thing. So many references to pit bulls as killers or relentless exist in our day to day lives. As a Nebraska Football fan and youth athletic coach, I have seen references to athletes being "like a pitbull", once engaged don't quit, etc. So if the conventional wisdom is that pit bulls are extremely powerful, scary, dangerous dogs, why is it that the AKC, Best Friends, Animal Planet, National Geographic, Sports Illustrated, etc. would have the public believe otherwise. I have seen gumball type machines in supermarkets with figures in a dog fighting scenario. Two plastic dog fighter figurines complete with tattoos and a pit bull in attack stance. Set of 3. They disappeared before I could take a picture, but the vending machine businesses have some explaining to do. Although these are often franchised out to individuals to place and stock, they have to purchase the stock filling the machines from either the vending machine companies or approved distributors. The vending machine company may have a business relationship with the specific corporate offices of the markets or stores. It is a sad thought to think of rich white dog fighters preying on poor children via cheap trinkets. "So if the conventional wisdom is that pit bulls are extremely powerful, scary, dangerous dogs, why is it that the AKC, Best Friends, Animal Planet, National Geographic, Sports Illustrated, etc. would have the public believe otherwise?" Because there is money in it, always follow the money. Can anyone get the names of the vending machine companies/distributors? They should be posted right on the vending machines.